Ata glance: All measurements are displayed on the 7" touchscreen. Easy start-up: Hot-swappable sensors can simply be replaced or added without interrupting operations. Modular design: Display unit and up to six sensor cubes in a single system. Additional sensors can be retrofitted as and when required. Minimum water consumption: Thanks to sensor miniaturisation. 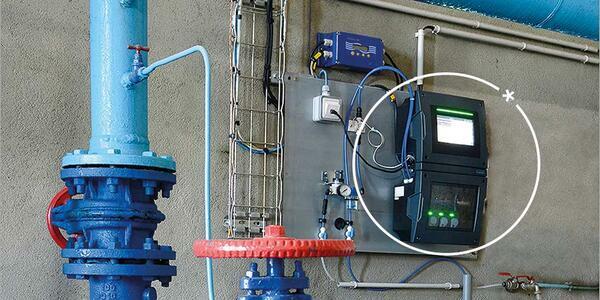 The French Association of Local Municipalities Grand Poitiers chose Bürkert’s Online Analysis System Type 8905 for the permanent analysis of its drinking water. These water analysis systems provide the municipal administration with easy start-up options, reliable measurements and low maintenance costs, as well as the flexibility of an evolving system. The municipal administration Grand Poitiers picked Bürkert to equip its water supply plants. Seven Online Analysis Systems Type 8905 have been installed in water towers, in particular, since April 2017. “When it came to choosing the equipment, we had to consider various criteria: reliability of the measurements, maintenance costs and the short response times of the company,” says Céline Lelard, who is responsible for drinking water production in Grand Poitiers. Agence Régionale de Santé, the regional health agency, currently offers recommendations regarding disinfection and the values that need to be observed. “Permanent measurements allow us to monitor the various parameters and thus follow the recommendations. Even though this is not yet mandatory, we are able to check the quality of the water at any time. And that guarantees safety,” says Céline Lelard. Four parameters are checked at present: pH value, temperature, chlorine and conductivity. Further measurement parameters can be added if so desired. This level of flexibility impressed the municipal administration.